Trotta covered corruption, fees, water quality, school safety, Red Light Cameras, the county’s budget and fiscal situation, and more. 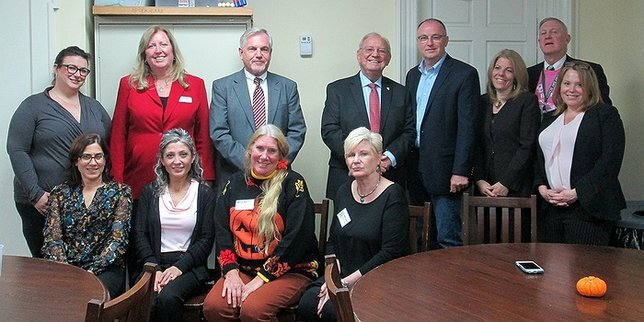 Legislator Rob Trotta (rear row, fifth from left) is pictured with some of the members of the St. James Chamber of Commerce. Smithtown, NY - October 23, 2018 - At the October meeting of the St. James Chamber of Commerce, held at the Harbor Country Day School, Suffolk County Legislator Rob Trotta was the keynote speaker. He covered a lot of topics: campaign finance, corruption, fees, the County Executive’s Waiver Committee, water quality, sewers, the county’s Alarm Program, school safety, Red Light Cameras, and the county’s budget and fiscal situation. “I am elected by the people in my district and it is my obligation to say the truth and that is exactly what I do,” said Legislator Trotta. He encouraged those attending to listen to his Trotta Talks, where he discusses county issues and programs, which can be found on his Facebook page or on YouTube. Subject: LongIsland.com - Your Name sent you Article details of "Suffolk County Legislator Rob Trotta Addresses St. James Chamber of Commerce"